The new Carvaan Mini Bhakti is said to deliver up to 4 hours of battery life and comes with six months of warranty. Saregama has launched its new Carvaan Mini Bhakti device that comes preloaded with 300 devotional songs. like the company's previous offerings, the new device also doesn't need any internet connectivity to function and comes with AM/FM, Bluetooth and USB functionalities. The Carvaan Mini is priced at Rs 2,490 and will be available on the Saregama website and via retail outlets. 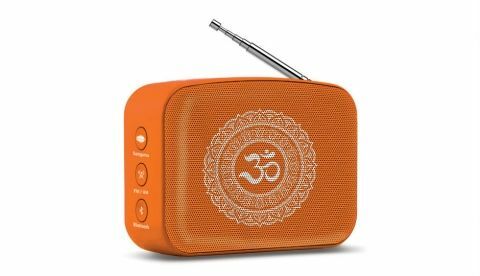 Saregama launches Carvaan Mini Bhakti, a product designed to cater the generation that has high dependency on others to listen to their favourite devotional songs. It has preloaded 300 devotional songs and can be started with just press of a button. Like other Carvaan devices, it does not need internet or connectivity with your phone to play it. A perfect device to start your day! Categorized by deities like Shiv, Ganesh, Krishna, Sai, Devi and Ram, Hanuman, Carvaan Mini Bhakti has pre-loaded repertoire of 300 songs - bhajans, aartis, mantras and more. Much like the previous versions of Carvaan Mini, it is compact in size with power speakers and features like AM/FM, Bluetooth and a USB to enjoy one’s personal favorites as well.